All prices quoted by us include value added tax. For deliveries to Austria and Germany, there is an all-inclusive delivery charge of EUR 5.00 per order. 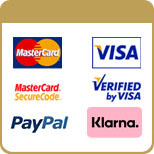 For purchases over EUR 100.00, no delivery charges will be raised. For deliveries to all other countries in Europe we will charge of EUR 7.00 per order. With order values of EUR 100.00 we will deliver free of charge. or in Austria on Tel. : +43 1/6981030 | or in Germany on Tel. : +49 89/2441040 0.